Author: McCrumb, Sharyn Set In . . . 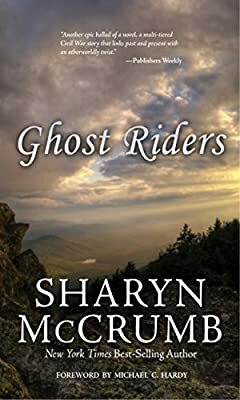 Critically acclaimed New York Times-best-selling author Sharyn McCrumb chronicles the Civil War in the Southern mountains in Ghost Riders, an extraordinary tale of a war fought farm to farm, neighbor to neighbor in the North Carolina mountains, a part of the South that never wanted to leave the Union. Ghost Riders is “a compelling Civil War tale with a chilling twist” (Library Journal), primarily narrated by historical figures Zebulon Vance (colonel of the 26th North Carolina and later Confederate governor of North Carolina) and Malinda Blalock (who disguised herself as a boy and went with her husband when he was forced to enlist in the Confederate army). With few people left to trust, the Blalocks head for high ground to avoid the county militia and soon become hard-riding, deadly outlaws. Rattler, an old mountain root doctor who has the sight, speaks for the present; he fears that the zeal of a local Wake County, Tennessee, Civil War reenactors' group will awaken the restless spirits of the real soldiers still wandering the mountains. Ghost Riders captures the horrors of a war that tore families apart, turned neighbors into enemies, and left the survivors bitter long after the fighting was officially over. This new paperback edition has a foreword by North Carolina Civil War historian Michael Hardy. Sharyn McCrumb is an award-winning Southern writer best known for her Appalachian Ballad novels, including New York Times bestsellers The Ballad of Frankie Silver, She Walks These Hills, and The Ballad of Tom Dooley. Ghost Riders was the winner of the Wilma Dykeman Award for Literature, given by the East Tennessee Historical Society, and the Audie Award for Best Recorded Book. She was a guest author at the National Festival of the Book in Washington, D.C. sponsored by the White House in 2006, and in 2008, the Library of Virginia named her a "Virginia Woman of History" for Achievement in Literature. In 2014, she was awarded the Mary Frances Hobson Prize for Southern Literature by North Carolina's Chowan University. She lives and writes near Roanoke, Virginia.